You can crochet with yarn made from many different plant fibers and animal fibers. But there is no reason to stop with the familiar materials you find in the yarn store. You can basically crochet with anything that resembles string; it doesn't have to be a fiber at all. Get inspired by these unusual media used by artists and innovators for crochet. 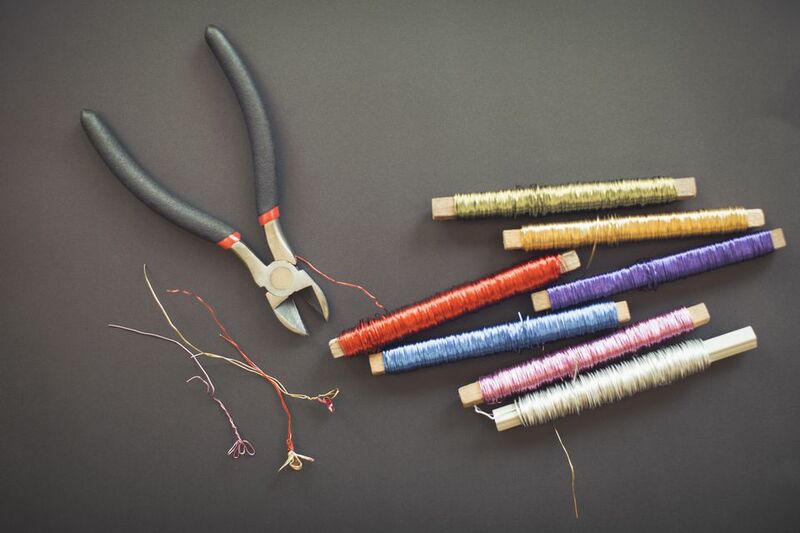 Fabric can be turned into thin strips and connected together to create beautiful yarn-like material that is used for crochet. The most well-known examples of this are rag rug crochet and T-shirt yarn. This is a great way to upcycle scraps, worn clothing and linens, and thrift shop finds. When an heirloom is beyond its useful life to wear, you can save the memories by using it for crochet projects. If you often participate in charity runs and walks that give you a T-shirt, this is a way to clean out your closet while keeping the memories alive. You don't have to search for ways to recycle plastic bags once you know they can be turned into yarn, called plarn. Then the plarn can be used to make a wide range of useful items such as a rainhat, bag, backpack, trivet, or pot scrubber. One common charity idea is to use plarn to create sleeping mats for the homeless. Learn how to make plarn here. Wire crochet is commonly used to create beautiful jewelry. You crochet with very thin wire in the same way that you crochet with yarn. Wire crochet can be used to create other items besides jewelry, like wire crochet lamps. Very few people have mastered the art of crocheting with glass, but believe it or not, it can be done. Artists like Catherine Carr have perfected the art of making glass crochet items. Almost any kind of paper can be turned into a yarn-like fabric if you're patient enough to work with it in a way so that it doesn't tear. Ivano Vitali has proven as much with his newspaper crochet fashion. This is another example of upcycling so what might end up in a landfill is transformed into something usable. Head to a local thrift store or yard sale and rescue a handful of old VHS tapes or cassette tapes from the bargain bin. Pull the ribbon out of those tapes and use it like yarn to create beautiful upcycled crochet items. It's a little bit stiff, so it's great for making durable items like vases and vessels. It's really difficult to crochet using balloons as your material, but it can be done, as artist Olek has proven. Inflated or semi-inflated balloons tied together can make interesting and fun sculptures. How durable they are is questionable, so they might be best for temporary displays. Laurie Wheeler writes, "From licorice ropes and cooked spaghetti, intrepid crochet lovers have made projects that amuse and inspire other crocheters to take it one step further in the quest to find unusual 'fibers. '” She herself has crocheted with bacon.